I had every intention of posting one of these last week but well the road to youknowwhere is paved with those good intentions right? And then I had every intention of posting this on Friday but I posted a review of Stopmotion Explosion so I thought oh I'll post it on Saturday. As you can see that didn't happen because today is Sunday. 1. Turtlegirl is down to crunch time and has to make a decision about which university she wants to attend. Last weekend most of us made a very long 3 day/2 night trip to visit a campus on the other side of the state. Yesterday, she with her father and Tailorbear, was visiting another campus much closer to home but still a couple of hours away. 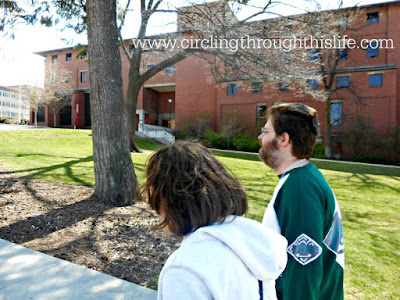 Turtlegirl and her Daddy explore the college campus! 2. While Turtlegirl, Tailorbear, and Honeybear made the 3 hour (one way) trip to visit the college campus, Boobear traveled with the Campus Ministry group from her college to an Orthodox Monastery. She was delighted when Abbot Tryphon remembered her. As is his custom he included a photo of the visit in his The Morning Offering blog today. I am always encouraged by reading his posts. 3. I've been thinking I needed to do more "neurodevelopment" type activities with Supergirl. God must have peeked into my heart because the Schoolhouse Review crew is reviewing Linguistic Development through Poetry Memorization by Andrew Pudewa. As a crew leader I received a copy of the program so that I can do my job, but I might end up writing a review even though I do not have to! 4. Speaking of reviews, did you catch my review of Logic of English? I reviewed the Level A of Foundations. 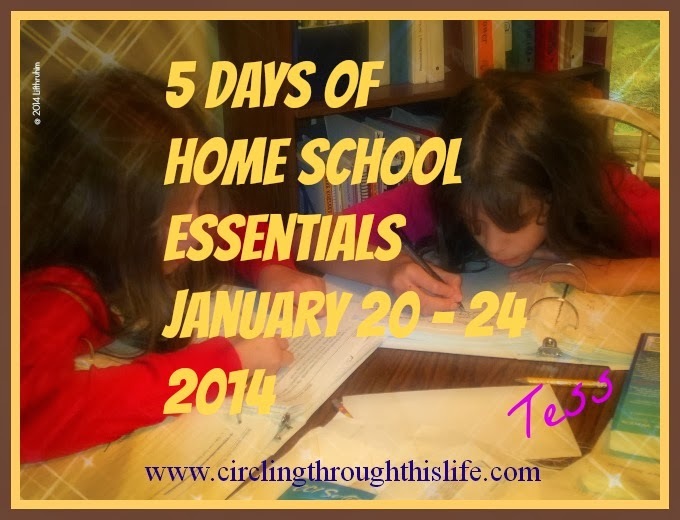 We started out at a slower pace and now we are doing 1 lesson a day, 3-4 days a week. Since Supergirl is already reading cvc words, but isn't fluent, I'm adding in "read to mom" as part of our daily schedule. 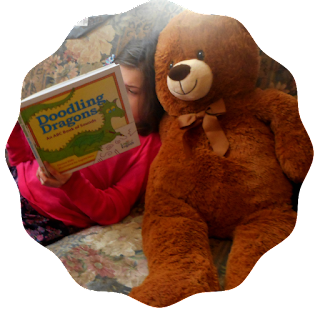 She needs practice reading real books to increase her fluency. 5. I know the calendar says April but I think my brain is still stuck in February or maybe early March but not mid-April! Pascha is about as late as it can be this year but my brain still can't wrap around the fact that it is 3 weeks from today. Palm Sunday is just two weeks away! Five Things about Holy Week!